Copra is produced by drying the coconut kernel. The copra quality is strongly dependant on the drying techniques. Inadequate drying gives rise to the growth of alfatoxins and affects the amount of coconut oil that can be derived from a nut. Proper post-harvesting methods including drying and storage can increase the oil yield per nut by about 20% ( Ref: FAO). It is important to reduce the water content by drying to about 6% (coconut fruit has a water content of about 50%).To achieve this, husking and drying of the copra should take place within 48 hours of harvesting. Solar drying: Inexpensive but can only be done during dry days. This process is suitable for small quantities of nuts. As solar energy is abundant in the PICs, this method should be employed wherever possible using solar dryers. Copra produced is dark and at times burnt. Nuts are heated indirectly by hot air. The copra produced is clean and white. Expensive. Maintenance and repair costs are high. This dryer recently developed by CPCRI India, is essentially a solar dryer but can also be run on a number of fuels: biomass as well as electricity. It has a capacity to dry about 2000 nuts every 24 hours. 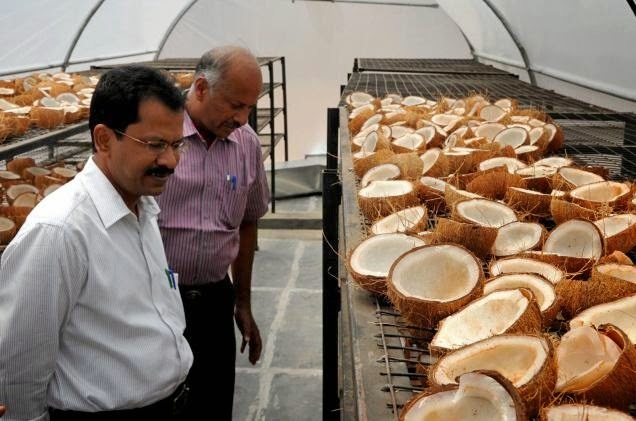 The cost of complete unit is about USD 1000 (The Hindu, May 2005) Once we have good quality copra it is ready to be converted into Coconut oil. 1 Response to "Methods are used in Drying Copra"
Are there any chemical methods to process copra? Chemical methods are said to be harmful health?